The Tinytag Instrumentation range of voltage, current and count data loggers can be used to record outputs from a variety of third-party sensors to measure properties such as pressure, flow-rate, rainfall and footfall. These units can be custom configured to user specifications, scaled to show readings appropriate for the sensor they are connected to. Our custom scaling service enables us to create customised data loggers for a wide range of applications. Logger inputs include voltage from 0 to 25V DC and current from 0 to 20mA DC. A count input data logger will also record up to 14,000 counts per logging interval. The battery powered, portable Tinytag Instrumentation loggers are available in two case styles; the rugged and waterproof Plus 2 case, and the splash-proof View 2 case with a display. The data loggers also have a high reading resolution and accuracy, and include a low battery monitor. View Tinytag Instrumentation data logging range. The loggers require Tinytag Explorer software and a USB download cable (CAB-0007-USB). The logger is supplied with the appropriate input lead to connect it to a third-party sensor, and for sensors that already have an output cable, a 2/5 pin connector plug is available separately. To confirm that your chosen logger can be configured to work with a specific sensor, please contact us using our Instrumentation online form. Alternatively, please call us to discuss your requirements. Once we have confirmed that we can proceed, a reference number for the configuration will be supplied for you to add to your order. Turnaround time will be five working days. Each data logger will be given a unique custom scaling reference number, displayed on its label, to enable future units to be easily configured to the same specifications. Tinytag count loggers are used to create custom-made impact data loggers for scientists studying sediment movement in rivers. Temperature and count data loggers are used to monitor cave conditions as part of a project to reconstruct past climate change. Tinytag count loggers have been deployed to monitor water meters for analysing consumption and usage profiles to hospital wards. 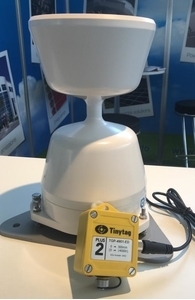 Historic England chose Tinytags as part of a flooding and energy efficiency research project: Millivolt data loggers were used with solarimeter sensors, while Plus 2 loggers were used to measure outdoor temperatures. The Scottish Environment Protection Agency is using Tinytag count input data loggers connected to a rain gauge to record rainfall data as part of vital flood warning work. Tinytag count data loggers connected to a tipping bucket rain gauge are used by the Peak District National Park Authority to help monitor the impact of moorland conservation and restoration on rainfall flowing overland across the surface of the moor. Range of voltage, current and count input data loggers that can be used to record outputs from third-party sensors. These units can be factory configured/scaled to show readings appropriate for the sensor they are connected to. To confirm that one of our Instrumentation data loggers can be configured/scaled to work with your specific sensor, please submit our online form.